Quite often, many people get motivated to plan for retirement too late. They walk into our office a few years before retirement as the first real deep dive towards figuring out how they can retirement. Those who are engineers come in with homemade spreadsheets to project their financial future. Successful salespeople stroll in spinning stories about how they figured out how they would manage the transition to retirement with downsizing homes and planning for future inheritances but with none of the plan written down. What’s the commonality between these two new clients and virtually every other hopeful retiree? They forget to calculate for the missing impact of inflation. Here’s the best way to summarize it: the cost of living adjustment on a month to month, year over year basis. Over the past 100 years, inflation has averaged about 3.22% per year according to www.inflationdata.com and since the financial crisis, we haven’t thought much about it because it has only gone up about 2% per year. In this chart, you can see how low it has been since the financial crisis and why we haven’t spoken about it much lately. Here’s the thing: inflation is finally starting to heat up a bit. In the chart, you can see May 2018 was at 2.8%. This is a significant number because it’s the highest we’ve seen since the end of 2011/early 2012. Also at that time, the Federal Reserve was being accommodative with ultra-low interest rates, expanding their balance sheet with Quantitative Easing (QE) programs and focusing more on stabilizing the U.S. economy as opposed to letting inflation fears dominate their actions. Today, we are years removed from the less steady days of 2011 and 2012; the Federal Reserve is tightening interest rates – not accommodating our financial markets while inflation starts to creep higher. 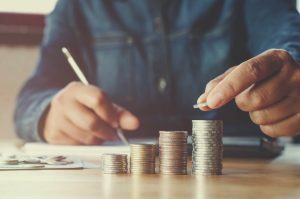 With inflation potentially becoming a larger issue with the economy, we want to take this opportunity to remind you to take it’s impact into consideration on your retirement plan because it can and will eat away purchasing power over time. Investopedia describes this issue best: purchasing power is important because, all else being equal, inflation decreases the amount of goods or services you would be able to purchase. What this essentially means is that your dollars will buy less over time as inflation gradually makes goods and services more expensive. If you think about it, we all know that a haircut, movie ticket, car or home will become more expensive over time. This chart from www.mybudget360.com shows how inflation changed the price of many commonly used goods over the past 40 years. Let’s discuss a few interesting data points. Some items went up MORE THAN inflation – home prices, college costs and cars. Some items did not – incomes, movie tickets, stamps and common grocery items like milk and eggs. Retirees should note that food inflation could be much higher than normal inflation and the rate of inflation on things commonly used can and will be more expensive over time. What you should pay special attention to is that over this 30-year period, that small 2.5% inflation increase equals DOUBLE your expense needs. You should be hoping that the next 30 years feature less inflation than the last 100 years. If we see it at the historical norm of 3.22%, the $100,000 cost of living goes up to $250,000 by year 30! So, it’s not just an increase of 100%, rather potentially 150%! Worse yet, many economists fear that the money creating days of our financial crisis may lead to even more inflation than we experienced historically. All factors considered – including an inflation component to your plan isn’t just good practice, it’s vital! Be sure to spend time establishing and creating your lasting retirement plan. If you already have a financial plan, double check the rate of inflation used to calculate your long-term expense needs.